Sribu has 3 (three) payment methods ie: Bank Transfer, Credit Card and PayPal. Log-in your Sribu account, click the "profile" icon at the upper right corner of the website. Select "Transaction" in the dropdown menu. In the invoice page, click the "Make a Payment" button. You will be directed to the next page that contains your order details and invoice. If you have a voucher code, key in the provided space and click the "Apply Voucher" button. 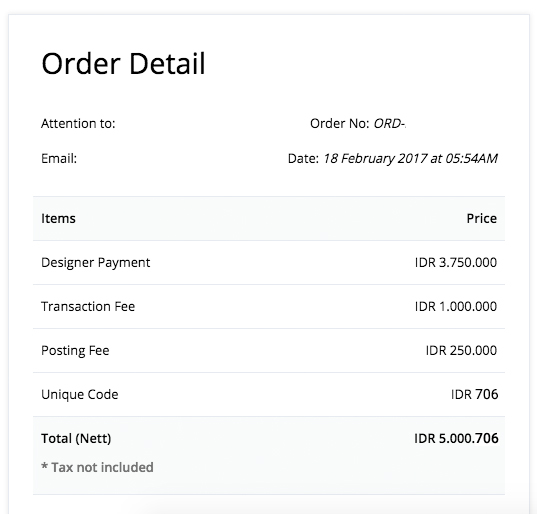 The amount of the invoice will be automatically reduced. And then, select the preferred payment method. Choose the payment method that you prefer. Bank Transfer, available for BCA and Mandiri bank accounts. Click the bank logo you wish to use ( BCA or Mandiri) to view Sribu's bank account for transfer purpose and click "Complete This Order". Once you have paid your order, confirm payment and Sribu will officially run your contest. Click the Visa & Mastercard logo and click "Complete This Order". You will then be directed to Midtrans payment gateway website. Fill in your credit card information. Your payment will be automatically confirmed and Sribu will begin your contest shortly. Click the Paypal logo and "Complete This Order". You will then be directed to PayPal website. Fill in your paypal information. Clients will received an email payment confirmation and your contest is officially running.